Thinking about retirement? What can our Government do to help? An interesting and informative discussion was presented by Citizen Services Specialist, Bill Gregory, at the Bridgetown and Area Library on Tuesday, May 3, 2016. The subjects under discussion were the Service Canada programs and services for seniors; the Canada Pension Plan; Old Age Security; the Guaranteed Income Supplement and the Canada Pension Disability, all intertwined with questions and answers from those participating. Canada Pension Plan (CPP) – Every person in Canada over the age of 18 years and with work employment earnings over $3,500.00 per year can contribute to the CPP from that age until you begin receiving CPP Retirement Pension. You can receive a full CPP retirement pension at age 65 or receive it as early as age 60 with a reduction, or as late as age 70 with an increase. If you continue to work while receiving your CPP retirement pension, and are under age 70, you can continue to participate in the CPP. Your CPP contributions will go toward post-retirement benefits which will increase your retirement income. Couples who live together and are at least 60 years of age can apply for and receive CPP retirement pensions, and if only one of you is a CPP contributor, you can share that one pension for income tax purposes. CPP benefits include, among others, survivor benefits and disability benefits. The survivor benefit includes a death benefit of up to a one-time maximum amount of $2,500. To qualify for the disability benefit you must have sufficient contributions to the CPP, be less than 65 years of age, and have a ‘severe and prolonged’ disability as defined by CPP legislation. Old Age Security Pension (OAS)– To qualify for an OAS pension while living in Canada, you must be 65 years of age or more, must have lived in Canada for a minimum of 10 years after age 18, and you must be a Canadian citizen or legal resident of Canada at the time of pension approval. In April 2013, Service Canada began sending letters to eligible seniors for automatic enrollment. A supplemental OAS benefit is the Guaranteed Income Supplement. In order to qualify, you must be a Canadian resident, must be eligible for an OAS pension, and must meet the income requirements. Submitted by Phyllis Nixon, author, retiree, and dedicated library patron. Take advantage of our new pilot project and borrow a recycled, preloaded eReader. 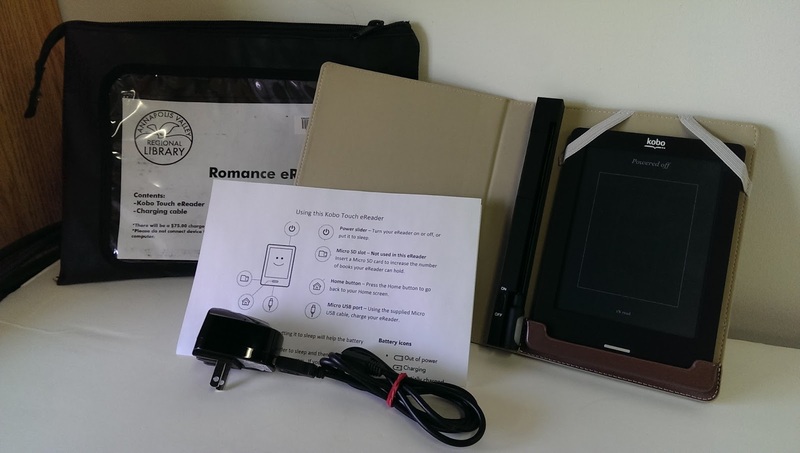 These eReaders come in a zippered pouch and include a charger and use instructions. Each eReader has a different genre theme. The themes include mystery, romance, historical fiction and general fiction. There are ten titles on each device for you to choose from. You can see what titles are available on these eReaders by searching the catalogue for the word eReader, then looking in the table of contents of that item. Oh, you should look often as these titles will be changed. You can borrow the eReader for three weeks at a time. Have you recently replaced your eReader and you aren’t sure what to do with the old one. If it is still in good operating condition, you can donate it to us. We’ll add it to this program and you’ll get a receipt for income tax purposes. The receipt will be for one half of the current purchase price of the device. There is a new threat on the horizon, a little scheme that Bad Guys On The Internet Inc. have come up with to try to separate people from their hard earned moolah. Enclosed in those spurious email attachments the baddies are claiming are your bank statements, parcel instructions and even court notices, is a bit of code that will go through your hard drive encrypting documents, pictures and just about anything else you save for later use. They then contact you through email or a pop up telling you it will cost several hundred dollars worth of bitcoins for the key to unlock your files. This has happened locally and is looking like it will be the new big scam of 2016. The first thing you can do to avoid this happening is to not open any files that contain the extensions .zip, .exe, .bat, .cmd, etc. unless you have verified that it is actually from the person it says it is from. Some people have been getting "court notices" that are sent unsolicited in a .zip file. Please don't open these as they have been known to make a small tear in the space-time continuum. If we get too many of these, the universe as we know it may cease to exist and that could ruin any plans you have for the weekend. The same warning goes for rogue web page pop-ups. These can be coded to run any of a number of nefarious programs that could send an interstellar signal to an army of alien space ships, telling them to come out from behind Saturn and invade the earth. We’re sure you don't want a bunch of aliens shooting lasers at your extended family members at the annual family gathering (most of them anyway). The best way to prevent this is to close out the offending window pressing the Alt key then F4. We joke, but the threat is real. The best course of action is to have a backup procedure in place. Portable USB hard drives have come down in price and are a good investment. They often come with programs that will allow you to set up an automated backup that will begin as soon as you plug the drive in. 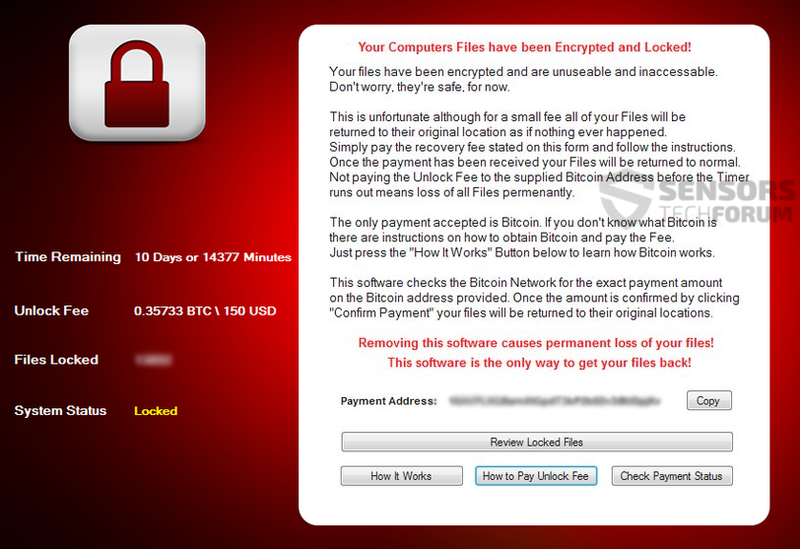 Don’t leave the drive connected as the ransomware could infect that along with your hard drive. Make a schedule, perhaps once a week, when you will connect the USB hard drive, allow it to run the backup, then disconnect it when it is finished. We can't all be out there fighting the alien horde, but we can help by keeping our little piece of the world's knowledge and information safe. Even if it's only pictures of Grandma's 80th birthday celebration. You love to read. Have you ever met the folks who write the books you love? They are real people who have families and eat dinner, just like you. We’ve got some local authors and illustrators that just might be your neighbors. 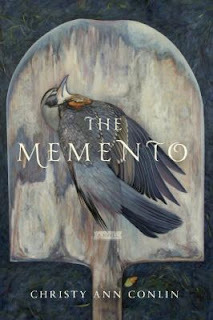 Recently, Christy Ann Conlin published a new book, The Memento. “The Memento tells the story of Fancy Mosher as she lives and works in the servants’ quarters at Petal’s End, a formerly illustrious private land surrounded by dense forest belonging to the famed Parker family. Fancy grows up listening to her family’s ghost stories and watching the Parkers from a safe distance with her best friend, Art.” Anyone who lives in the Valley will recognize places, people, and sayings in this literary gothic novel. You can meet Christy Ann at her book launch on Thursday, May 5 at the Al Whittle theatre in Wolfville. Ron Lightburn is another local who has recently written a children’s book about garbage. Most of you may know Ron from his book The Pumpkin People, which his partner Sandra wrote. Ron has illustrated many books, including Juba This, JubaThat, which we made into a StoryWalk. 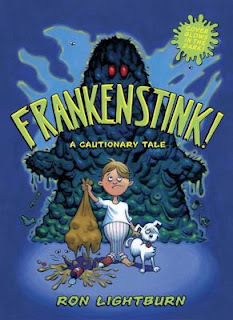 If you want something funny and gross that also teaches a lesson, you have to try Ron’s latest book, Frankenstink, which was just awarded the Lillian Shepherd Award for Excellence in Illustration at the Atlantic Book Awards! 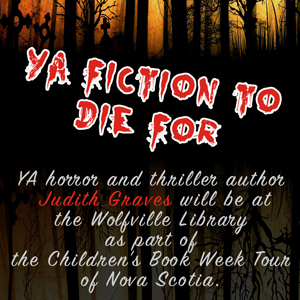 Judith Graves helps you dig deep and unearth the killer themes lurking in your horror and thriller fiction. This genre isn't just writing tales of blood and guts - it's creating fiction to DIE for. Learn how to get under your reader's skin, play on their primal fears, and hold mirrors up to their own inner monsters. These FANGtastic tips will keep your readers turning the page...to the dire end. She says it will be a bit scary but no blood and guts. There will also be Creepy Cupcakes for you to enjoy, so if you are a writer who wants some tips, or just a rabid reader (ages 12 and up, please), start your Friday the 13th with YA Fiction to Die For. PS - Get a head start on things and read her book, Exposed.